Companies of all sizes face cybersecurity risks from multiple fronts, inside and out. Lack of cybersecurity can lead to compliance costs, data loss, business disruption, and lost customers. JohnsTek’s Cyber Risk Management Program provides 24/7 protection from hackers, ransomware, spear-phishing campaigns, and more. Auditing, testing, and assessment of your systems and policies to identify cyber security vulnerabilities. 24/7 monitoring and reporting of cyber threat intelligence and forensics to provide customized protection of your data and operations. Cybersecurity risk management services provide complete protection from cyber risk from insider threats and external sources. Cyber security isn’t just a concern for large companies. Organizations of all sizes are threatened by cyber risks from multiple fronts, from Insider threats and outside attacks. 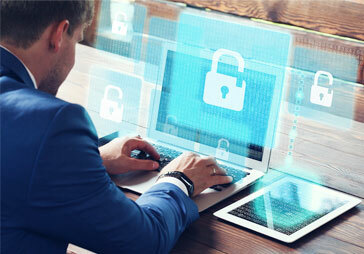 A lack of cyber security can leave your company facing the real possibility of loss from compliance costs, data loss, business disruption, and lost customers. JohnTek’s robust cyber security program can save you money by protecting you from ransomware, denial of service attacks, and phishing attacks brought by cyber-criminals, social engineers, and hackers. What Makes JohnsTek Stand Above The Rest? JohnsTek’s Cyber Risk Management Program provides the total cyber security package. The team is comprised of former senior members of the U.S. Military, Federal and State Law Enforcement and the Intelligence Community, trusted by US and Foreign Governments with management of their most sensitive data in their national security space, and provide solutions. Fortune 500 corporations in the US and internationally have relied on JohnsTek’s knowledge and expertise in the security of their information. JohnTek’s team brings decades of experience in cyber security and threat intelligence to work for you. Not a big box, one size fits all solution, like some of the larger competitors, JohnTek’s skills and expertise are focused on providing cyber security solutions that are customized to meet each client’s needs. Contact us for a free NO OBLIGATION consultation to assess your needs in CyberSecurity Vulnerabilities, Network, Information Systems, and Data Management.